Plants that come back year after year! We offer a huge variety of Perennials. The perennials we offer are in 1 QT, 1 Gal, 2 Gal, and 3 Gal containers. Each year we evaluate which ones performed well and look for new and exciting varieties to offer to our customers. We use Riverbend Nursery as our source for perennials that we buy in. We feel that because they specialize in growing perennials, they can offer us the best. Perennials have become so important to most gardeners because most will bloom for years if properly planted, fertilized, and maintained. Planting once and enjoying flowers for years is especially enticing to our customers. Many will visit often to add to their perennial collection that ranges from Daylilies, Peonies, Butterfly Bushes, Echinacea, Verbena, and the list goes on and on. Plants that live one year! We offer a huge selection of annuals that are used primarily for seasonal color. They can be used in container combinations, as well as, in the landscape of your home or business. We buy in from local suppliers that take as much pride in the quality of their plants as we do. Before accepting any shipments from other growers, incoming plants are inspected for pests and diseases. We refuse anything that could be questionable. Plants that live one year! We offer a huge selection of annuals that are used primarily for seasonal color. They can be used in container combinations, as well as, in the landscape of your home or business. We buy in from local suppliers that take as much pride in the quality of their plants as we do. Before accepting any shipments from other growers, incoming plants are inspected for pests and diseases. We refuse anything that could be questionable. We are constantly seeking our new varieties that are exciting, and better performers to add to our menu.We are constantly seeking our new varieties that are exciting, and better performers to add to our menu. Stepables are easy to grow, durable, creeping perennials that are easy to maintain, reduce weeds, solve problem areas in the landscape, and hold up to foot traffic. Each one has a distinct foot shaped tag with photo and plant care tips. They are great for pathways, ponds, containers, herb gardens, around mailboxes, garbage can areas and more. We offer a wide selection of Steppables to choose from. We buy in top quality trees and shrubs from local nurseries. Our signage is informative so that you will be able to shop and make an informative decision on what you will need. Our staff is also available to answer questions. The key ingredient to having a beautiful landscape is planning! Before you begin to shop for trees and shrubs, it is a great idea to have dimensions of the area you wish to plant. Know how large of specimens you will be looking for, know if there are windows to obstruct or structures to consider, whether you want evergreen (stay green all year) or deciduous (lose leaves) specimens. Check out other landscapes you admire. Take photos. Look through magazines. Considering these things will make your tree and shrubbery shopping go alot smoother. We offer an exciting array of succulents and house plants! Choose your favorites to create a beautiful dish garden or your own succulent garden. We offer many container gardens ready to go! What a great gift idea for someone special or yourself! 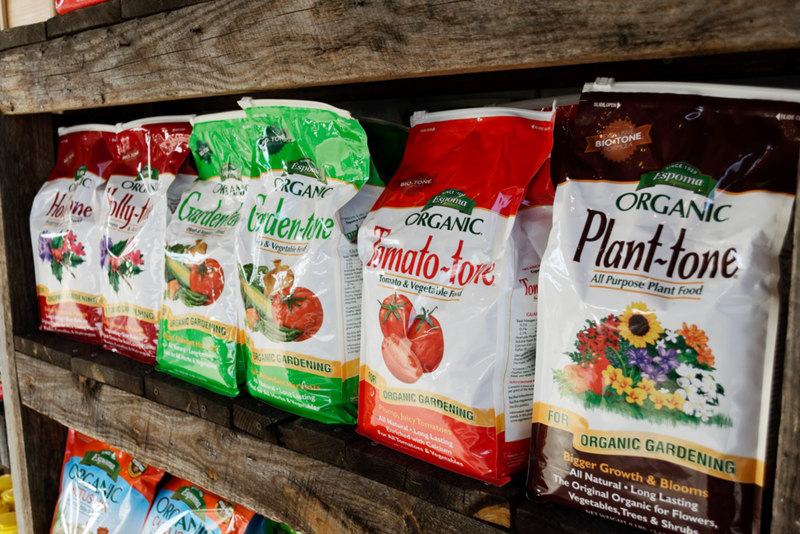 We offer a great variety of garden supplies! Our new and improved location boasts a market full of artisan and handmade goods! We now have Midtown merchandise! Check out our variety of t-shirts, tank tops and hats!